Here is another post in the series of reports from our President, Dr. Debra Reid as she particiaptes in the AIMA conference in Estonia. Shelf after shelf of seed specimens, too old to germinate, may challenge agricultural museum curators. They may exercise their de-accession policies to reduce the number of fragile glass containers and the seeds too old to germinate. But de-accessioning will eliminate a research tool that plant geneticists have started to use in their current DNA research. Dr. Jenny Hagenblad, Swedish plant geneticist at Uppsala University, made this persuasive argument in her presentation, “Dead Seeds Telling Stories: What Historical Collections and in situ Field Pea Research can Tell Us about Crop History,” delivered at Tartu, Estonia, 28 June 2013, during a conference recognizing the 45th anniversary of the founding of the Estonian National Agricultural Museum. Dr. Hagenblad described her research into the DNA of field pea specimens more than 100 years old. She and her research team compared that DNA to current specimens tended by gardeners who grow heirloom varieties. This is part of a larger project that involves other species as described in an article co-written by Matti W. Leino, Swedish Museum of Cultural History, and Hagenblad, “Nineteenth Century Seeds Reveal the Population Genetics of Landrace Barley (Hordeum vulgare),”published in the January 2010 issue of Molecular Biology and Evolution. Hagenblad called for others to participate in this important research that can serve modern needs but also support genetic diversity preservation. If you find yourself newly inspired to care for biological specimens in your collection, consult the National Park Services “Curatorial Care for Natural History Collections” (Appendix Q in the three-part Museum Handbook ), online at: http://www.nps.gov/museum/publications/MHI/AppendQ.pdf; the entire Handbook is available at: http://www.nps.gov/museum/publications/handbook.html. And contact Dr. Hagenblad in the Department of Plant Ecology, Uppsala University, Sweden, for more information. 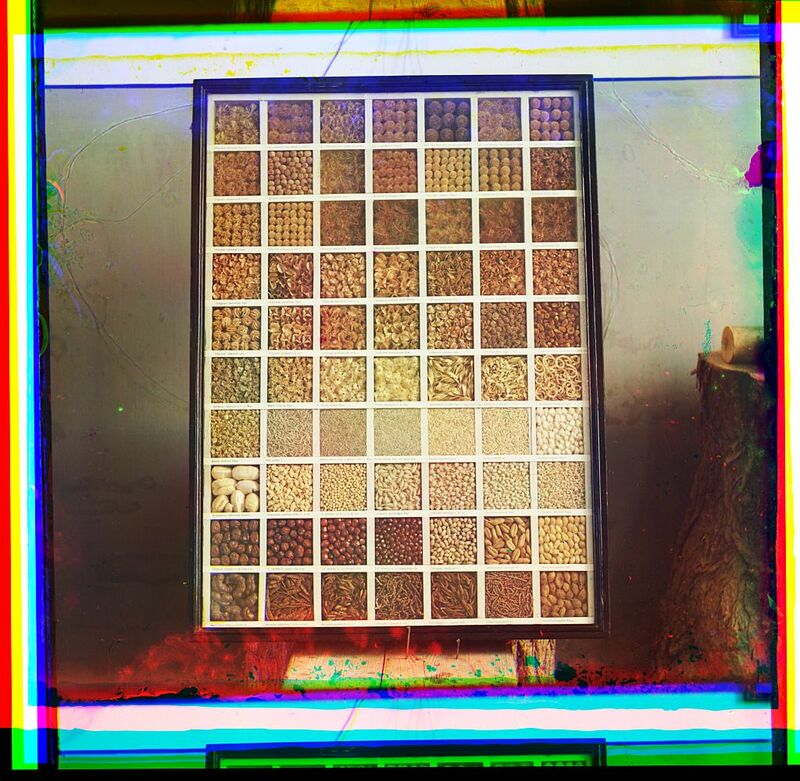 Biological Specimens (seeds and/or beans) in Display Case, 1905-1915. Photograph by Sergei Mikhailovich Prokudin-Gorskii (1863-1944), Library of Congress, Prints & Photographs Division, Prokudin-Gorskii Collection, [reproduction number, e.g., LC-DIG-prok-02044]. This entry was posted in AIMA, ALHFAM, Annual meeting, Education, food, growing food, seeds and tagged AIMA, ALHFAM, Estonia, research, science, seeds. Bookmark the permalink.